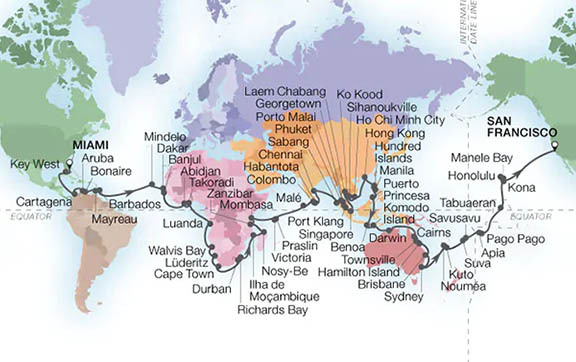 Join Seabourn for a globe-spanning journey to extraordinary destinations. You’ll interact with fascinating people and unforgettable places. Your World Cruise will visit 5 continents, 36 countries and 62 destinations and offers 77 days in port. Additionally, you will enjoy 16 overnights in port, and linger into the late evening another 18 times, enjoying more than one day exploring a port for every day spent relaxing at sea. Cross three great oceans, explore Africa’s coastline and visit undiscovered treasures and UNESCO World Heritage sites from Colombia to Mozambique, the Seychelles to South India, the Philippine Archipelago and Australia’s Queensland coast to New Caledonia. You can also enjoy optional mid-voyage overland tours in Namibia, South Africa, Kenya, India, Cambodia and Australia, with safari options from Cape Town, Durban and Zanzibar. World Cruisers share long-imagined adventures in congenial company and sumptuous surroundings complemented by superb hospitality, creating a special bond as they become well-traveled in a single voyage. Local entertainment and performances on board await, celebrating regional culture and arts. 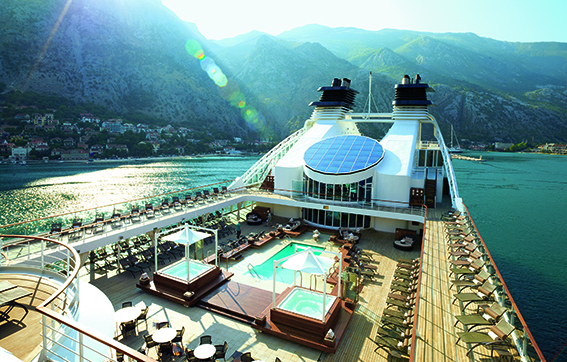 Plus, visits from noted luminaries and stimulating Seabourn Conversations add insight to each leg of your journey. * All prices quoted are PER PERSON in Australian Dollars and include taxes, fees and port expenses (if applicable). All prices quoted are for the cruise departing on 04Jan20. Prices for alternative departure dates may vary. Seabourn Sojourn offers 225 luxury suites, four dining venues, and six bars and lounges. Intense flavors, stellar service and intriguing food and wine pairings are the specialties of the house in this avant-garde restaurant. Dishes are prepared individually by the chef in tasting portions so you can enjoy a selection of innovative creations. Restaurant 2 will quickly become one of your favorite dinner spots aboard Seabourn Odyssey. Exclusive to Seabourn Sojourn is our indoor/outdoor restaurant, The Colonnade. Here, chefs serve breakfast, lunch and dinner in an open kitchen so you can watch them work their magic as they personally prepare your order. Each evening has a different theme, offering guests an ever-changing culinary experience.